Enhanced Interior Gateway Routing Protocol (EIGRP) is a Cisco Proprietary Routing Protocol. It has the same metrics as IGRP. 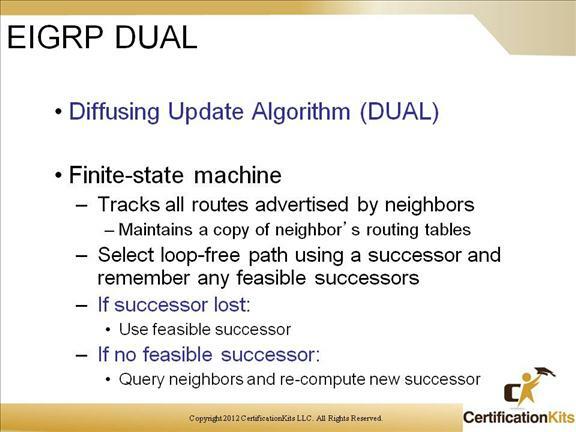 It uses Diffusing Update Algorithm (DUAL) to guarantee a loop free topology. 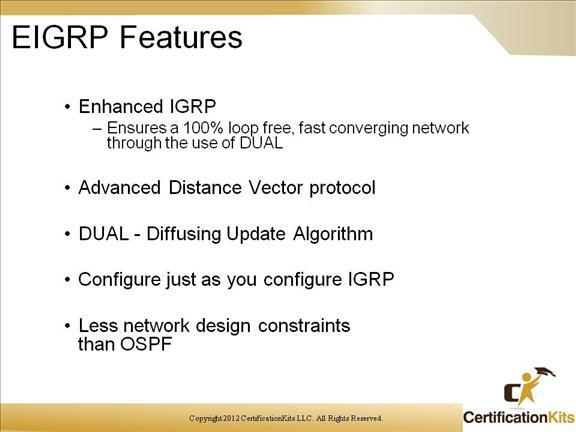 EIGRP uses less CPU resources than OSPF while also having fewer design constraints. It is considered an advanced distance vector routing protocol although it has some similarities to a link state routing protocol. 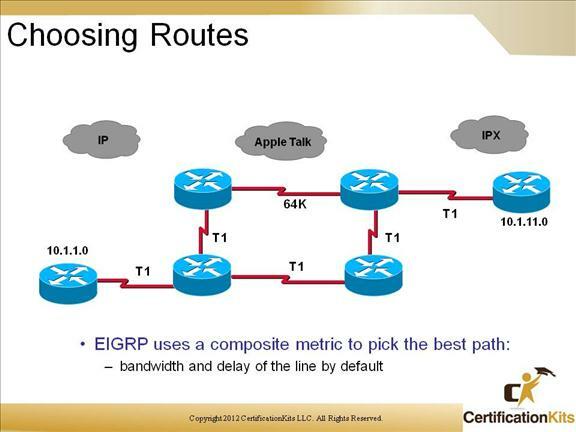 EIGRP, like OSPF communicates via multicast transmissions. 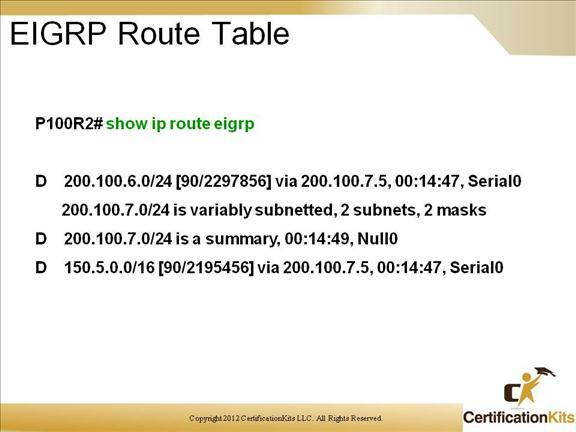 The multicast address that EIGRP uses is 224.0.0.10. 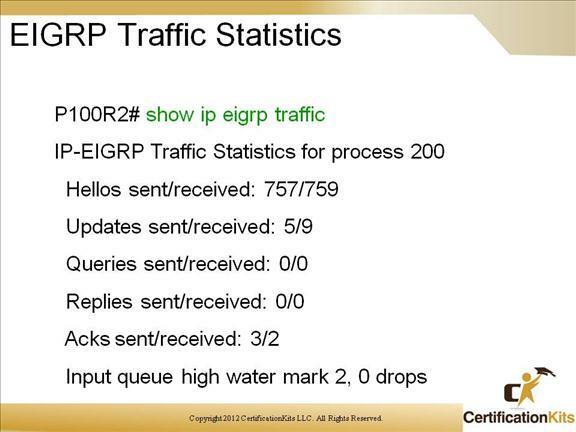 EIGRP initially floods its routing information to all neighbors, but then scales back and does not send a routing update unless there is a change in the routing information. 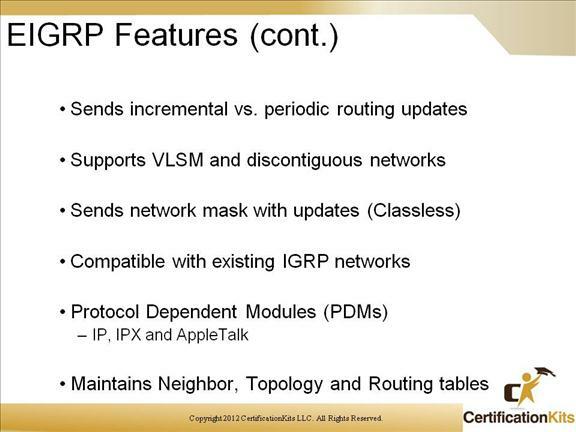 EIGRP supports VLSM because it will send the prefix, or mask information along with all of its routing updates. EIGRP by default will automatically summarize to the classful boundary, however you can turn this feature off using the no auto-summary command under the EIGRP router configuration mode. 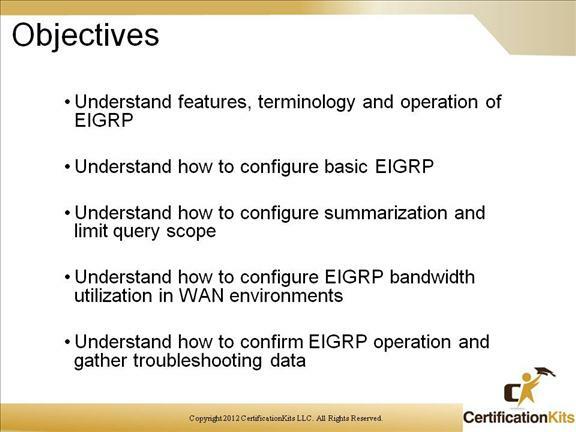 In the event you have IGRP configured in your network, EIGRP will do automatic redistribution in order to learn all of the available routes within IGRP. EIGRP keeps separate neighbor tables, topology tables and routing tables for each of the protocols you have configured in your network environment. By default the EIGRP process only uses 2 ‘K’ values, Bandwidth and Delay. 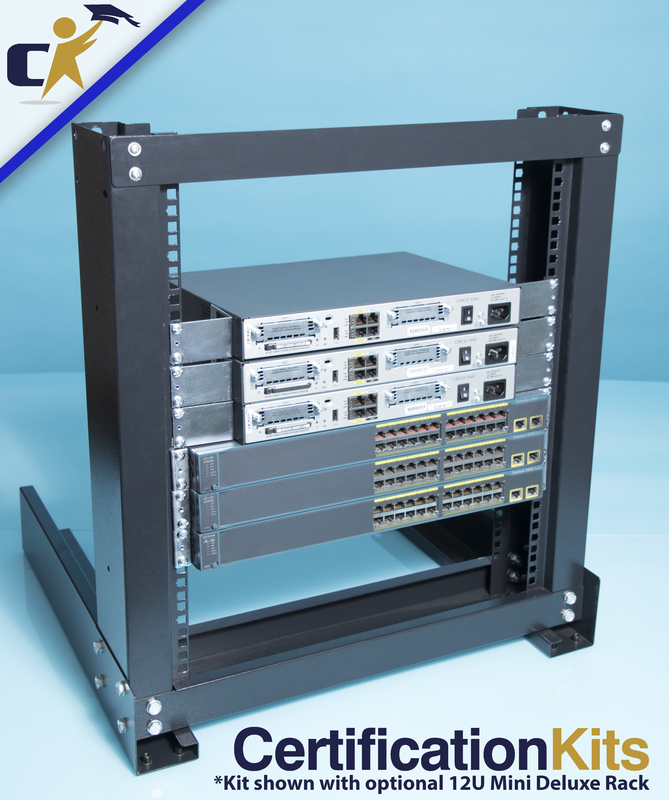 If any other ‘K’ values are turned on for one EIGRP router, they must be turned on for all other EIGRP routers. If this is not done, then only those EIGRP routes using the same ‘K’ values will recognize themselves as neighbors. Here we are viewing a topology table. We are trying to identify the best route (successor) from RouterA to network 10.26.99.0 on Router G.
Neighbor H states that it can get to network 10.26.99.0 with an advertised distance of 30. Considering that Neighbor H can get to network 10.26.99.0 and it cost Router H 30, how much does it cost Router A to get to Router H? It cost Router A 10 to get to Router H. So the Advertised Distances is now added to 10 which gives Router A a Feasible Distance of 40 to get to Network 10.26.99.0 via Router H.
Fill in the appropriate Feasible Distance now for the path though Router B and then for the path though Router D.
Now that we have found the Feasible Distance for all of our neighbors, we can now define the Successor and see if we have a valid feasible successor available. 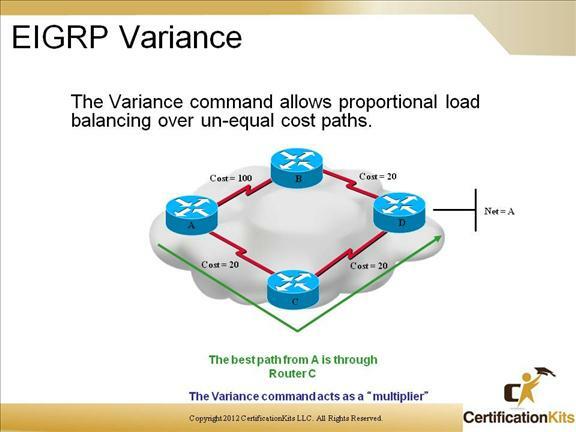 The Successor will be the least cost path to the remote network. The next best route does not automatically become the feasible successor, the route has to match certain criteria. The Feasible successor must have an advertised distance less than the current successors feasible distance. 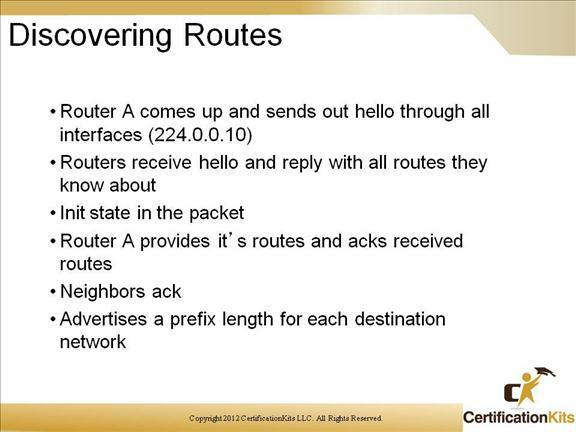 Route through B is current successor because it has the least cost path to network 10.26.99.0. 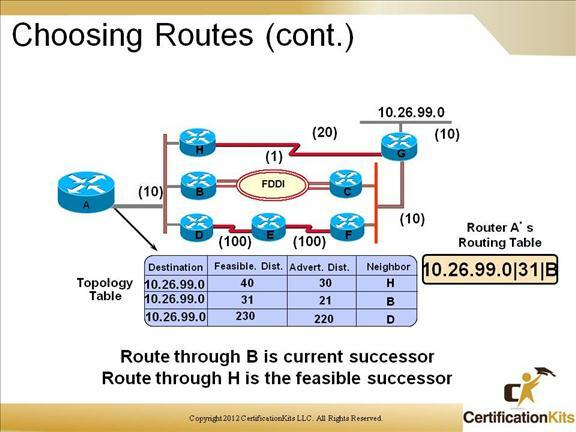 Route through H is the feasible successor because it has an AD less than the currents Successors FD to network 10.26.99.0. Query: A query happens with the Successor Route goes down and there is no known Feasible successor. 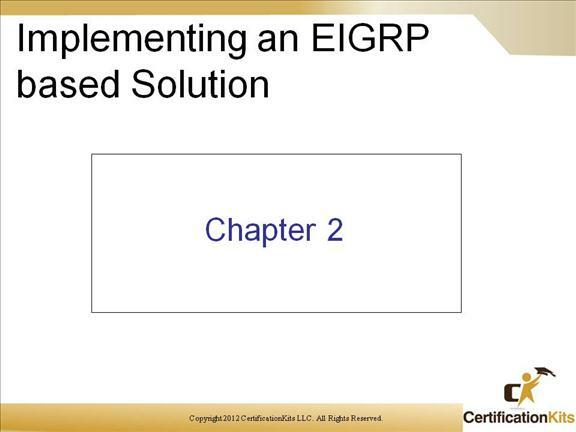 The EIGRP routing table represents the best routes found by EIGRP. 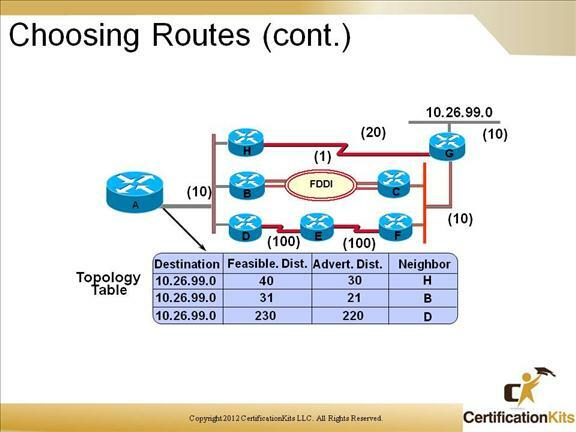 These routes will be presented to the Route processor for it to decide if they should be placed in the forwarding table (the routers routing table). Update – used to convey reachability of destinations. When a new neighbor is discovered, update packets are sent so the neighbor can build up its topology table. In this case, update packets are unicast. In other cases, such as a link cost change, updates are multicast. Updates are always transmitted reliably. Query – always multicast unless they are sent in response to a received query. In this case, it is unicast back to the successor that originated the query. Queries are transmitted reliably. Reply – always sent in response to queries to indicate to the originator that it does not need to go into Active state because it has feasible successors. Replies are unicast to the originator of the query. Replies are transmitted reliably. ACK – always sent using a unicast address and contain a non-zero acknowledgment number. EIGRP transport has window size of one (stop and wait mechanism). Every single reliable packet needs to be acknowledged before the next sequenced packet can be sent. If one or more peers are slow in acknowledging, all other peers suffer from this. 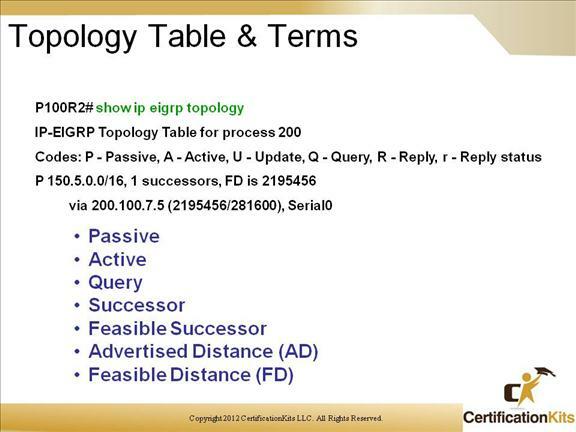 If your successor is lost, and your DUAL was unable to find a feasible successor a query is sent out to all of the EIGRP neighbors. 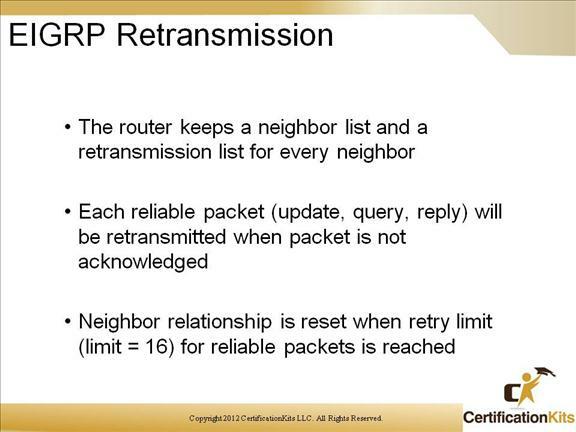 Each neighbor should respond to the query, if there is no response to the query, the route will become stuck in active. 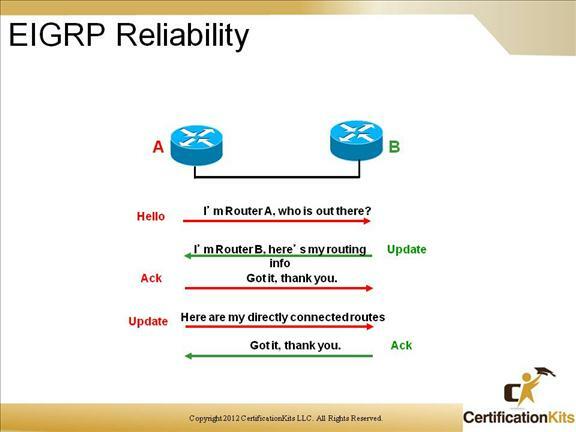 If all neighbors do respond, EIGRP evaluates their responses and calculates the most appropriate route to become the Successor. In some circumstances, it takes a very long time for a query to be answered. So long, in fact, that the router that issued the query gives up and clears its connection to the router that isn’t answering, effectively restarting the neighbor session. The most basic SIA routes occur when it simply takes too long for a query to reach the other end of the network and for a reply to travel back. 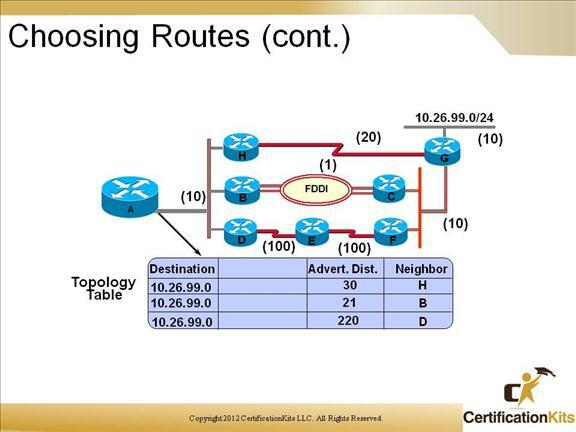 One of the most effective techniques for containing EIGRP queries is to use route summarization or stub networks. The result of this configuration is that the stub routers will send updates about routes they have to the hub router but the hub router will never query the stub router for updates in the event of a route being lost.